Here’s a few new fall fabrics I picked up at JoAnn’s last week. The right two are lightweight cotton; the patchworky one on the left is a mid-weight cotton; almost a lightweight canvas. The green cotton in the back was a thrift store find. Score! I whipped up a stroller bag with the middle print — which is just perfect for walking downtown to the bakery or thowing over my shoulder at the farmer’s market. However, little seester Kricket decided she really liked it when she was over the other day, and since it IS her birthday on Saturday, I will just have to make another one for me! Really cute fabric! I especially love that middle one 🙂 I’ll have to look for it at JoAnn’s next time I’m there. Hmmm…that’s funny…middle seester Elli really likes it too. Maybe you can make a matching set for all of us? Pretty please? I’ll throw myself another birthday so that you have an excuse. 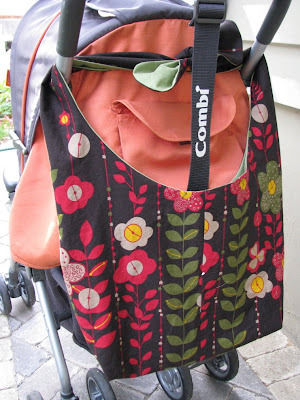 cute fabric, and cute stroller bag. walking down to the bakery in the morning….that sounds great! I really like it. I think the top tie got me. I like that it shows off the contrasting fabric. I love bags. They are simple to make and are beautiful. YAY!! happy birthday to ME. I really like that bag! The fabric works so well with it! We can always use MORE bags!! I like the middle one the best. THe bag is too cute! What a great idea! Love the fabric, too. HA! I have eyed (and picked up and put back) all three of those several times over the last few months. I love, love, love the flower one and wondered what I would make with it since they only came up from the bottom of the print (or maybe it was on both ends?!?). Anyway, I love the bag and can’t wait to see what else you create. I’m on a fabric freeze until I use up a lot of what I have (boo-hoo!!). 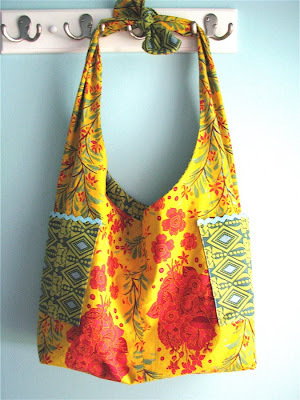 great bag – do you use a pattern for that? Ever notice that when you really NEED something–not just the “want it” need, but the real thing–it magically appears?? I really NEED a stroller bag, but wouldn’t have used that term or come up with the shape you have here. LOVE this! And now that I’m unexpectedly on hiatus with the early arrival of #3, I might actually be able to find some time to sew for myself and make one!! Oooh, I bet I could use that Japanese canvas I’ve been hoarding… Thanks for the inspiration! LOVE the new masthead! sooner or later, fall is gonna getcha. bring on the hayrides! I bought some of those fabrics too! 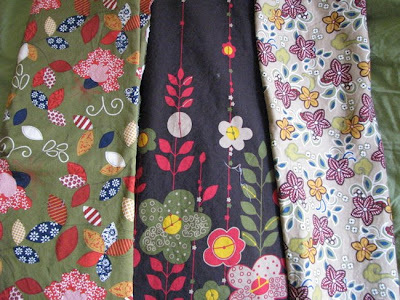 I made my daughter a skirt with one of them…did you see the blue polkadot one with the border print? Anyways…love your bag! Wow, I love the print on that nappy bag. Joann’s…really?? I’ll have to pay closer attention in there. I always made this type for the stroller and gave them away when I needed change.